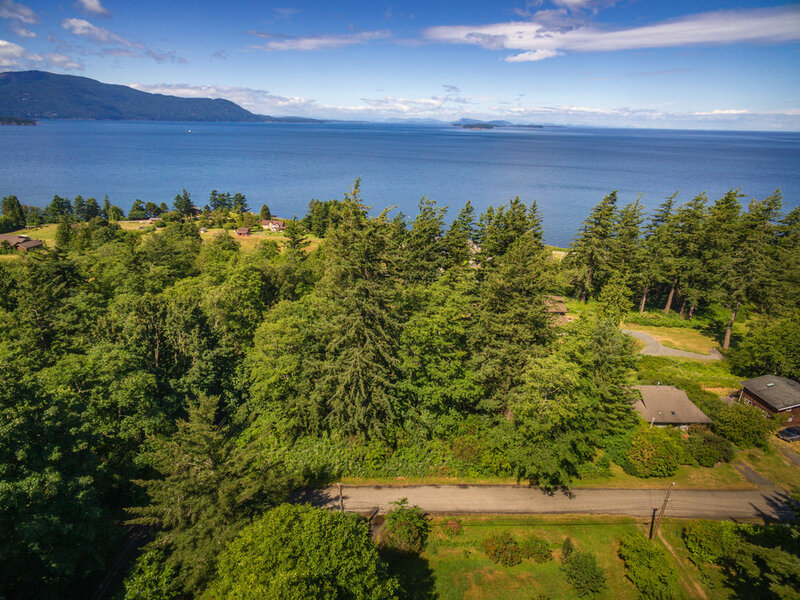 The inventory of properties for sale on Lummi Island is never large, but it can vary. The most affordable lots and homes are found in two developments: Scenic Estates on the southeast side, and Isle Aire on the northwest. Lummi Mountain occupies the south half of the island and is mostly undeveloped. The northern half is where you will find acreage parcels, homes on larger lots, a few inland properties, one condo grouping, and many waterfront homes. This warm and modern 2 bedroom, 2 bath home has been beautifully updated and maintained, is one block to the water, and has some view! The wall of windows and skylights create gorgeous natural light throughout the open floor plan. You will love the impeccable attention to detail, as well as the hardwood floors, fireplace, nice kitchen, master bedroom with bath, and French doors that access a spacious deck for good indoor-out flow. There is a fully fenced garden with raised beds, and stout outbuilding with tall ceiling and metal roof. Ownership includes salt water boat launch, swimming lake, and excellent community water. This lovely two bedroom cabin has outstanding views of Hales Passage, Portage Island and Bellingham Bay. There is one bedroom on the main, and a full loft bedroom up, plus the kitchen and bathroom have been updated. Many windows, gorgeous light and vaulted ceilings create an open feel, with private decks and fantastic indoor-outdoor flow that allow you to soak up the peace of all that nature presents here. Ownership includes salt water boat launch, swimming lake, and excellent community water. This amazing home is located on 1.77 sunny westside acres and includes 191' of pristine beach. It is spacious, impeccable and lovingly detailed in a Swedish architectural style, featuring lavish use of wood and trims, big windows framing beautiful views, walls of built-ins, multiple fireplaces and even a traditional sauna. There is an amazing array of rarely seen extras, including an arts and craft room with a wall of drawers, den with fireplace, office, an exercise room, a play room, huge upstairs family room, wine celar, storage rooms and a small woodshop. The kitchen is one-of-a-kind with a huge center island, Thermador gas cooktop, Sub-Zero refrigerator, double ovens, walk-in pantry, double sinks and an unbelievable amount of cabinetry. There is also a separate guest suite with 2 bedrooms, 2 baths, multipurpose room, living room with gas fireplace and spacious kitchen/dining room. Downstairs is another bath, laundry and the sauna! STATISTICS: House: 2 bedrooms, 3 1/2 baths, den, office, arts and craft room, exercise room, laundry, mudroom, formal entry. Guest Quarters: 2 bedrooms, 2 baths up, 1 bath down, multipurpose room, laundry plus sauna and 2 car garage. HEAT: radiant gas-fired recirculating pump. SQUARE FEET: 5235- total finished in both buildings BUILT: 2004. TAXES: $10,799. EXTRAS: automatic gas generator, hot tub, water purification and HEPA air filtration. Panoramic southerly views starting with the sunrise and Mount Baker to the East, and sweeping across the Strait of Georgia to the stunning sunsets that never cease to amaze. This pastoral 5.4 acres is ready to build with an installed three bedroom septic and water connection. 39 Private Acres on Blizard Road Now $599,000! Once in a life-time oppurtunity to create your own homestead on this sunny and totally private 39.4 acres on Lummi Island. The land is a mixture of pristine forest and cleared meadow....and is close to a beautiful, sandy west-side beach. It is protected by a Conservation Easement for residential and agricultural use by a single owner. Located on the southeast side of Lummi Mountain, Scenic Estates properties are nestled among the towering cedars and firs, most with lovely views of Mt. Baker, Hales Passage, and Portage Island. The woods is teaming with an amazing variety of birds, and white tailed deer share the mountain with it's human residents. These lots are affordable, with many being ready to build, and all lots include excellent water supplied by a community water system. Owners can enjoy the salt water beach, the boat ramp and dock, use the clubhouse for special events, and swim in the fresh water lake further up the mountain. This is truly a vacation paradise. $55,000 - 2965 Hales Passage Drive: Double lot, trees cleared, needs septic..adjacent lot (see below) is also for sale and has an installed septic. Isle Aire and Sunset Beach are adjacent communities on Lummi's westside. Ownership includes rights to the island's finest expanse of sandy, west-facing beach, as well as tideland rights that allow owners to install their own mooring buoy off the beach. Boaters can use this as the perfect launch point for exploring the other islands in the San Juan archipeligo. This is a good choice for those seeking western sun, a lovely community of well-kept homes, an excellent community water system, and access to a truly wonderful beach. West side building lot with views (and potential for greater views). A short walk to the beach. Call Angie for more information at 360-815-6569.